Tilseth Pool has been one of the most productive pools on the NFC waters in the past few seasons. This pool offers perfect flywater with perfect water speeds and also holds fish all season long. The pool fishes best on medium to lower water levels and when casting distances are moderate. 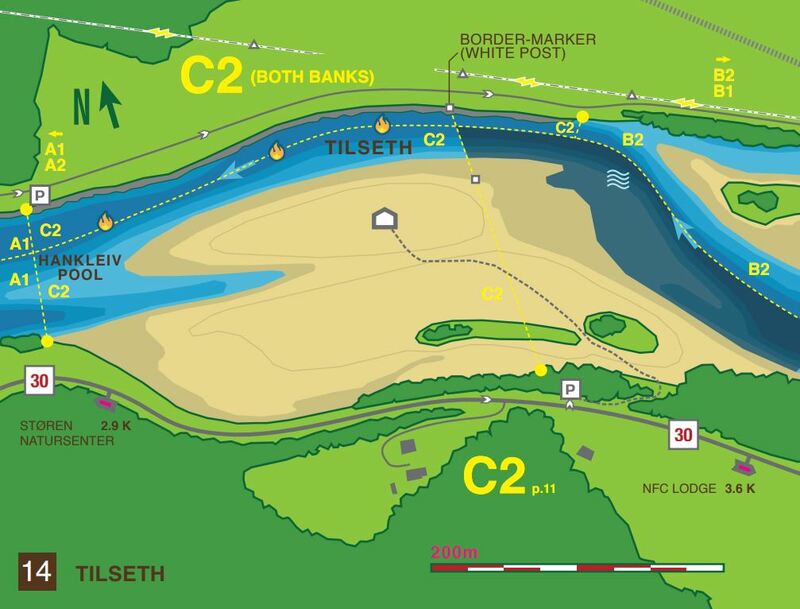 An important thing to note is that when fishing from the left bank (it is double bank, but we usually recommend fishing from the left bank) that one respects the border at the top of the beat. Other landowners own the very upper part, and a white stick on the right bank and another mark on the gravel bank marks the border. Please do not begin fishing above that border marker. In higher water levels, above 100 m³ at Gaulfossen, the middle and lower part of the pool fish the best. If water is above 160m³, the fishable section of the pool becomes very short and only the tail out fishes well, but it’s always worth a try using sinking lines. The bottom end usually holds very big fish! In 2011, a fish weighing 17,4kg was landed in this spot! In higher levels, one can start on the upper border, on the left bank, but fish this upper part fast and concentrate on the middle and lower sections- the chances here are much higher to hook fish. In higher levels fish with medium and heavy sinking lines, depending on water temperature and time of the season (June –fish deep, July and August higher up). In medium water, the pool reaches a perfect speed and fishes well all the way through. While the lower section of the pool may begin to fish. While there are no specific taking spots, we recommend fishing rapidly through, and focusing anywhere one feels a take, contact or hooks a fish, as often one will hook fish at the same spot again. Start fishing on the upper border with floating, intermediate or floating and sink tip lines. Flies with a bit of weight have proven to be very effective here. During night times Sunrays and any larger black patterns are always a good choice. On sunny days, typical daytime patterns like Green Highlander and Silver Grey usually work well- sizes depend on temperature, water clarity, etc. In August “shrimpy” patterns or Francis/Snældas often entice salmon to take. It’s important to fish the pool rather quickly with different methods several times during a session. It is a long pool, and if the water is clear, walk a few meters in between each cast. As soon as the water gets lower, one can even try to fish the right bank. In low water, start fishing as far up as possible, directly at the top border (please be respectful of fishermen from the neighboring beat upstream and do not step in when someone is just about to finish the pool at their lower border. Please let them fish and step in afterward). At this water level, the hot spot is the upper part of the pool and most fish are hooked high up. Take note that it is still worth fishing the pool down to the tail, and while in the last third the water slows down, but there are some large fish which always hold there. Strip in the line when the swing gets too slow, as this can be a good method to get the fishes attention! In low water fish floating lines with intermediate tips or poly leaders. We recommend fishing close to the surface -as salmon will rise to the fly through the water column. 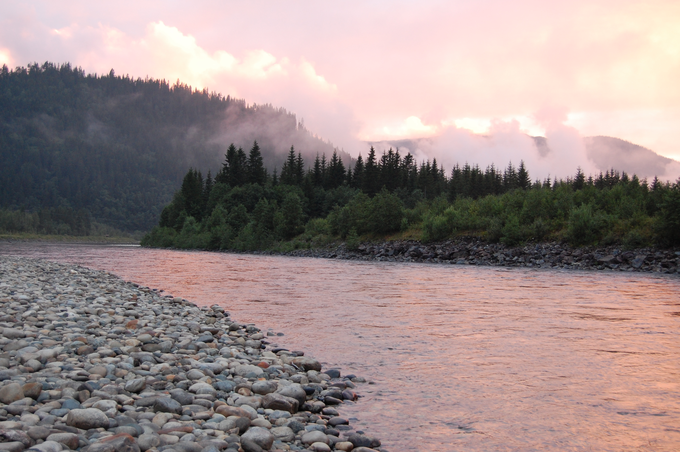 Tilseth is one of the best low water spots on the Gaula and always holds fish – even after a few hours of nothing happening things can change in a minute and suddenly the pool will be active, and one has a chance to hook a fish. Keep in mind to fish the pool quickly. The lower the water level, the faster one can fish through but should rest the pool between each go.